What can you do to make things easier for local wildlife during the colder weather? The nights are longer, the days are colder, we’ve even had the odd dousing of frost on our lawns. It’s a good thing us and our pets have central heating to keep us cosy, not to mention a hoard of treats and toys to keep us occupied. Let’s have a look at how to help the creatures who aren’t quite as lucky, shall we? That’s right, ignoring the garden all through the winter is good for wildlife – so get your feet up! 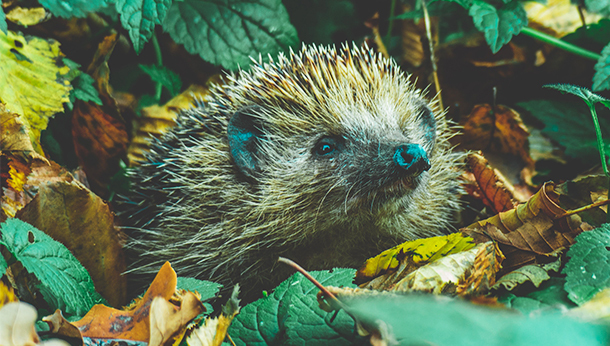 Undisturbed wild areas like piles of leaves or brushwood are great spots for animals to hide in and they can also use them for rest and even hibernation. Leaving your garden this way until early spring means that animals will have shelter throughout the winter. If you do any major moving about in the garden at this time of year, be sure to double check for sleeping hedgehogs. Okay, so we might be a bit early with this one! If your garden pond (or a pond near you) happens to freeze over, make sure you pop a few holes in the ice. We advise this because toxic gases build up in water when it’s completely covered by ice and this can be fatal to any fish or frogs inside. When breaking ice, take care to do so gently. Avoid breaking it using force or scalding/boiling water. We recommend placing a pan of hot water on top of the ice and letting it melt its way through. Birds struggle during winter months because berries, worms and other insects are harder to come by – right at a time when they need all the body fat they can get, too! Leaving out food for birds is a massive help to them. Garden birds will eat seeds, dried worms, nuts and even table scraps. Just like food, water can be harder to come by for local wildlife during the winter. Leaving some out in your garden will be a great help. Whether it’s a small bowl for hedgehogs or a birdbath for your feathered friends, the cleaner the water, the better. You’ll also want to replenish it regularly so that it doesn’t freeze! You can help squirrels, badgers, hedgehogs and foxes by leaving out small morsels of food for them to snack on. This doesn’t have to be right in the centre of your garden and it doesn’t have to be a great deal of food - in fact somewhere close to the animal’s territory is ideal, and small portions are perfect because you don’t want them to become fully dependent on handouts. If you’re prone to one particular species, try doing research about the best snacks to leave out. Meat scraps, cheeses, nuts and fruit are all good starting points, though. For more information on helping out local wildlife during the run-up to winter, we recommend the RSPCA’s website. You can also contact a local wildlife trust. If there’s something in particular you’re concerned about and you’d like to discuss it, call us today.